BRACKNELL, UK. 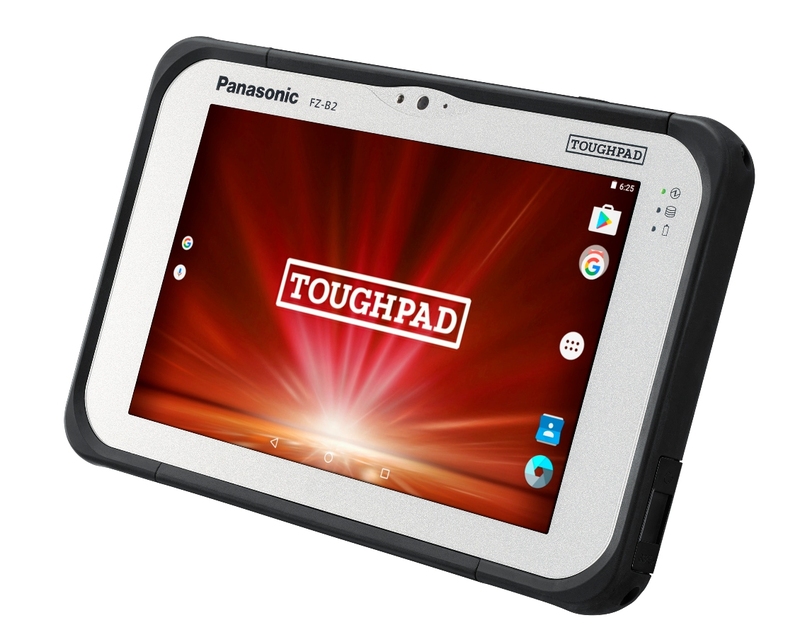 31ST MAY 2016 Panasonic has today raised the bar in the rugged Android™ tablet market by increasing the performance, improving the management capability and building in more business flexibility into the refresh of its market-leading 7.0 inch Toughpad FZ-B2 tablet. Equipped with the latest Intel® Atom™ x5-Z8550 Quad Core processor (2 MB cache, 1.44GHz up to 2.4GHz) and running the Android™ 6.0, Marshmallow operating system, the Panasonic Toughpad FZ-B2 fully rugged tablet delivers a 32% performance improvement* over its predecessor with an enhanced battery life up to 8 hours in the same lightweight (540g), slim (18mm), ergonomic and fanless design. The device is also loaded with business options to meet the different needs of enterprise, with three customization areas where combinations of a bar code reader, smartcard reader, LAN, 4G can be specified. This latest generation device is also the first to include a USB 3.1 type C port for reversible connection, with transmission speeds of up to 5Gbps, power charging (up to 5V 900mA – USB PD is not supported) and USB On The Go functionality for easily copying and transferring files from the Android™ device to a PC. For increased manageability, the device includes Google Android™ for Work allowing separate work and personal profiles to be included on the device. Providing IT administrators with flexibility and enterprise security whilst ensuring users have private access to their own personal applications and data. Google Android™ for Work also includes a range of built-in productivity tools for everyday tasks such as email, contacts and calendar. For outside viewing, the latest Toughbook FZ-B2 has a wider viewing angle than other tablets in its class, with higher visibility (500cd/m2) and a lower sun reflection rate. The multi-finger, 10-point capacitive touchscreen can be used by hand, gloved hand or with an optional passive stylus for precise writing and signature capture, even in the rain. For organisations with a mix of Android™ and Windows devices, the Toughpad FZ-B2 can be used with the same peripherals, such as cradles, vehicle mounts, batteries and chargers as its Windows-based sister device the Toughpad FZ-M1. With its optional hot swappable battery, the Panasonic Toughpad FZ-B2 can work as long as is required in the field as 8 hours with a single battery charge or 16 hours with the extended battery option. For users needing live video conference capabilities or to capture photographic images of documentation in the field, the FZ-B2 is equipped with upgraded Full HD front web and 8 megapixel rear cameras. It also comes equipped with built-in directional array microphones ideal for communication, video conferencing and voice recognition software. The Toughpad FZ-B2 is optimised for connectivity whatever the location and includes the latest Intel® Dual Band® Wireless-AC 8260 technology for the fastest data transfer and Bluetooth® v4.2. Built for the rigors of business, the Toughpad FZ-B2 is drop tested to 150 cm*** as well as having an IP65 ingress protection rating for resistance to dust and water and it will operate effectively in temperatures ranging from -10 to +50°C***. “With these latest upgrades to our Android™ device, we have designed a rugged tablet that can be customized to meet the demanding needs of many different mobile workers and that can also sit comfortably within an organisation’s IT strategy for easy management and compatibility,” said Jan Kaempfer, General Manager of Marketing for Panasonic Computer Product Solutions.